The Shadow Project is committed to equity, diversity, and inclusion in every aspect of the organization’s work. Shadow strives to remove longstanding barriers that block the path to educational success for students with learning challenges such as dyslexia, ADHD, and autism who are diverse in race, culture, and socio-economic status. 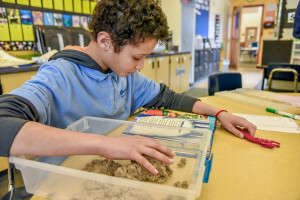 The organization works collaboratively to replace those barriers with opportunities, such as access to a range of materials, sensory tools and techniques tailored for diverse learners, while honoring each child’s history and experience. Using equity as a lens to focus on both the unmet needs of children with learning challenges and economic and cultural disparities, Shadow is rolling out a three-year plan to provide full-day support for students, incorporating administrators, teachers, schools from Head Start to K-8, and parents. This model is central to equity because it addresses the whole child, not just the disability. Working to reduce barriers that prevent children from feeling valued — such as shame over reading, or limited English proficiency — the organization is a partner in strengthening student and family connection to school, and normalizing what it means to learn differently.